By now everyone knows that the new 2020 Toyota Supra was more than just co-developed with BMW—it’s pretty much entirely a BMW inside and under its sheetmetal. That’s readily apparent when you’re greeted with an iDrive screen as soon as you step inside. But it and the 2019 BMW Z4 are said to be different cars, and ones that will drive differently from one another. So where did BMW end and Toyota begin on the new Supra? See, you may remember a few months ago when we, among other outlets, featured a widely circulated report that Toyota and BMW hadn’t actually talked to one another in years during the two cars’ development phase. It’s possible, but how did that explain all those spy photos, including recent ones, where the two cars were seen testing together in camouflage? To try and clear things up, I spoke to Ben Haushalter at the Detroit Auto Show. He’s the senior manager of product planning for Toyota’s sports cars, making him a Supra expert of sorts. And as someone who’s been working on this car for years now—remember, it’s been in the works since at least 2012—he started off by saying how happy he was to see it finally and officially see the light of day. Both cars are built by contract manufacturer Magna Steyr in Austria, too, hence the Supra’s VIN starting with a W. But BMW’s Z4, in U.S. spec, is 382 HP. I asked Haushalter why that is but the answer wasn’t very clear. “We look at, how does the car work together,” he said. “What is the chassis balance, what is the powertrain for that, and where we landed on that—335 provides us with the best combination of vehicle power and acceleration to the weight and chassis.” It’s a balanced amount for its size and weight, in other words. Notice the W on the VIN and the BMW emission control info sticker. This is Toyota’s second joint sports car development in recent years, following the partnership with Subaru that yielded the BRZ and 86. That car was pretty much all Subaru under the skin as well—a 2.0-liter Subaru boxer four and a platform adapted from the Impreza. The Supra took a similar path by being a BMW in pretty much every way that matters. Both cars had the same chief engineer too, Toyota’s Tetsuya Tada. Such partnerships are increasingly common as the sports car market dwindles globally, and as automakers look to still make them while cutting down on development costs. Mazda and Fiat have done something similar with the new Miata and 124 Spider, although the latter at least has its own unique engine. 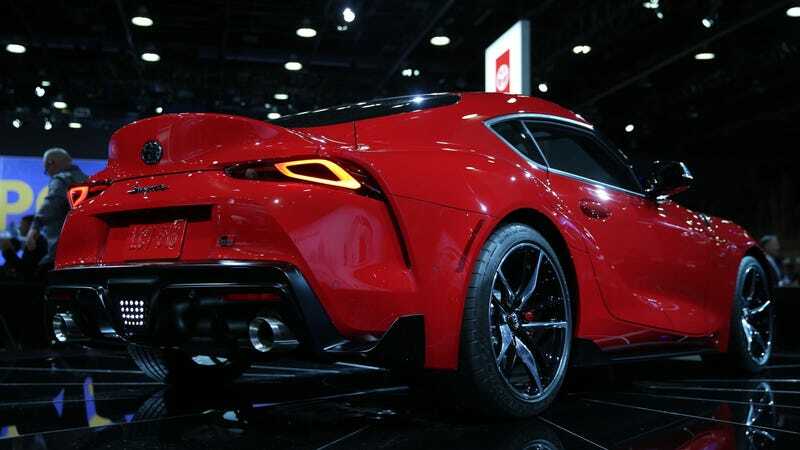 In Toyota’s case, executives have said BMW was the ideal partner for the Supra because it wanted to keep the inline-six as the engine, like every previous Supra has had. Since Toyota no longer makes its own straight six, the automaker had to go out and find one. This leads to the question of where the two brands diverged in development. So why then did we see the test mules hanging out together? As for how it compares to the Z4, Haushalter said he couldn’t compare the two, as he hasn’t driven BMW’s roadster yet. But he did comment on how the Supra compares to its intended target—the Porsche 718 Cayman and Boxster. At the very least it should be cheaper. The Cayman technically starts around $55,000, but with Porsche’s infamous options most of them are much more expensive than that. The ones we’ve tested at Jalopnik have generally run from about $80,000 to almost $100,000. A loaded Supra should go for under $60,000. So will the tuners embrace the new Supra as they did the last one? A huge part of the A80 Supra’s appeal was the tough iron-block twin-turbo 2JZ engine, capable of withstanding immense heat and pressure during modifications for wild horsepower gains. I personally have no doubt that tuners will try truly wild stuff with the new Supra—after all, there’s plenty of parts and tunes available for the new BMW M3, and a lot can be done with any modern turbo car—but it remains to be seen if BMW’s motor can put down crazy power and still be reliable. For his part, Haushalter said he hopes tuners embrace his new Supra.